Special Price (HOT PINK 40g & VIP Gold 40g at $7.90 ONLY upon purchase $200! Purchase $79 and get selected items at $2 ONLY! GRAB 50%OFF frm 12noon-1pm (1hour) ONLY. ** While Stocks lasts..
20%OFF on ALL ITEMS plus each day from Nov 28th-Dec 2nd (5days), we are showering our beloved SKIN79 BBholics with 50% OFF that will last for an hour only. This is to show our deep gratitude to all of you who have shown loved and given support for SKIN79 since we started. NOW JOIN US AS WE CELEBRATE OUR 2nd ANNIVERSARY! It will be an appointed time by our Management, for more info kindly stay tuned here at our Fanpage, we'll sure to keep you posted :) For Nov 28th 50% OFF allocated time will be from 12noon-1pm, I'm sure VIP GOLD BB , assorted cleansers will be on 50% OFF plus a lot more... :) See you! 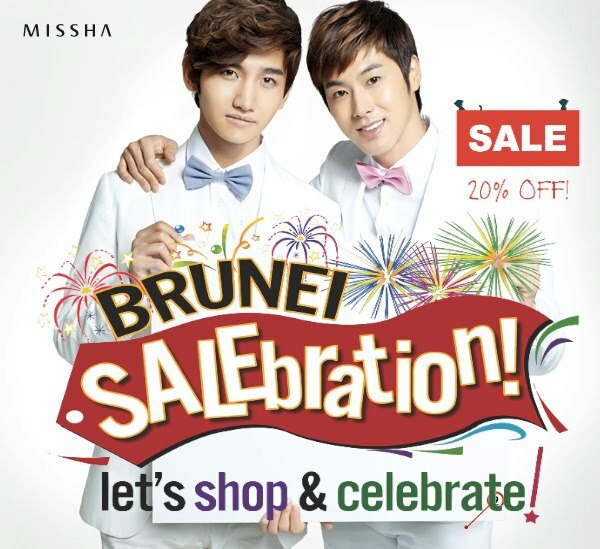 MISSHA SALE IS ON! BRUNEI SALEBRATION 2012. Shop @ Sarah 4th ANNIVERSARY SALE!!!!!!!!!!!!!!! I might be buying the VIP Gold or the Vital Orange, or maybe both LOL. Nice blog btw.. Hehe.. have been following your blog but have not drop a acomment. :) Anyway, I just want to ask the sale at Shop at Sarah is until when? You have? *tutup muka* :P Hehe thank you!! Cool! Hahha.. You do know who I am right? Lol!